Ah yes, Campari. That bitter liqueur we Americans just can’t seem to love…but that’s OK. Even if we can’t bring ourselves to drink Campari on the rocks (try giving it to your friends without telling them what it is — quite entertaining, but they may never trust you again), we can mix it to great effect. Let the Italians do what they do best — i.e. drink all those bitter amari and apértifs — and we Americans will do what we do best: toss the bitters into a cocktail. Cherry, orange twist, or lemon twist to garnish. Stir with ice and strain into a chilled cocktail glass. Garnish with a maraschino cherry, orange twist, or lemon twist, as you like it. The Boulevardier emerges a wonderfully dark, ruby-red hue, with a deep spicy taste you’ll only get from this combination of powerful ingredients. As Ted Haigh and Paul Clarke have pointed out, the drink is essentially a Bourbon Negroni, or a bourbon Manhattan with Campari in lieu of bitters, depending on how you look at it. The Boulevadier is also remarkably similar to Audrey Saunders’ Little Italy; in all probability the Little Italy was created independently, given the workings of mixology. The origin of the Boulevardier lies with Erskine Gwynne, who was, says Haigh, an “expatriate writer, socialite, and nephew of railroad tycoon Alfred Vanderbilt” and the editor of The Paris Boulevardier, a magazine for Americans in Paris. Like many other ex-pats, Gwynne frequently found himself at Harry’s New York Bar, run by former New Yorker Harry McElhone — himself an ex-pat who had escaped to Europe before Prohibition was enacted. The Boulevardier was Erskine’s signature drink, a unique blend of American and Italian ingredients mixed by refugee bartenders according to the formulae they knew so well. Barflies and Cocktails, Harry’s now-obscure cocktail book from 1927 — one that many an ambitious mixologist would love to track down — contained the version of the Boulevardier featured here. Given the bitter, herbal firepower of the Campari, you’ll need a spicy bourbon for this drink: something like Buffalo Trace, Four Roses, or Russell’s Reserve, as Jason Wilson recommends. In Vintage Spirits & Forgotten Cocktails, Ted Haigh notes that the Boulevardier is one drink which greatly benefits from the use of Carpano Antica, and I have to agree — its strong, slightly bitter flavor meshes well with bourbon and Campari. Another sweet vermouth, like Martini, might not have enough punch or fruitiness to come through and complete the drink. 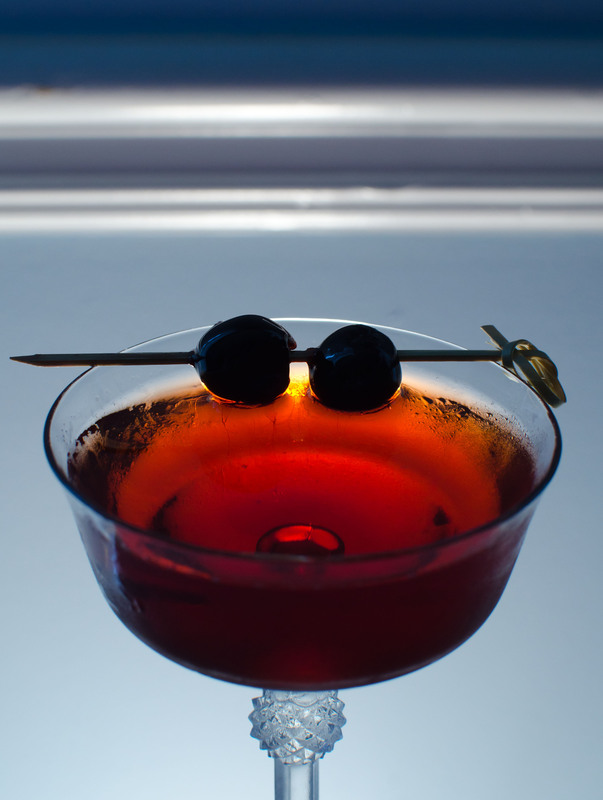 I like to garnish the Boulvardier with two maraschino cherries — it feels generous and elegant, plus a little bit of the syrup slowly floats off into the glass. Make sure they’re good cherries, either homemade or from Luxardo. Like the Negroni, the recipe invites tinkering, so feel free to try a 1:1:1 ratio in this one, or perhaps a 2:1:1 if you favor the whiskey, which could be either bourbon or rye; if you’re torn between the two, High West’s Bourye could work well. I was sooooo close to mixing up one of these last night and then writing about it! I too was browsing through my issue of Boozehound. This drink looks delicious. I must try it! Thanks, G-LO. It truly is delicious…probably my favorite Campari drink so far, though the Lucien Gaudin is a close second. 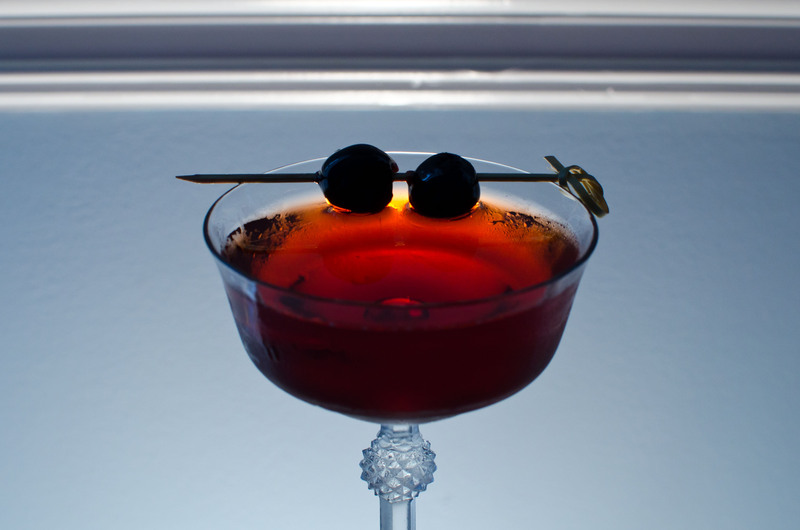 This entry was posted on September 16, 2011 by IJ Lauer in Bourbon, Campari, Drink Recipe, Rye, Sweet Vermouth and tagged boulevardier, bourbon, campari, carpano antica, cocktail, drink, erskinne gwynne, harry's new york bar, negroni, recipe, rye, sweet vermouth, variation.